We can say anything for sure that what's going to happen with us in the very next moment. Car accidents are so often and one may get stuck in its car after a nasty collision. So, we should all get ready to act wisely while saving our lives. Our emergency escape hammer is designed to bring you the ultimate relief in your tough times when you're struggling for your life. Break Car WindowLife is the most beloved things to us. So, take good care of it. 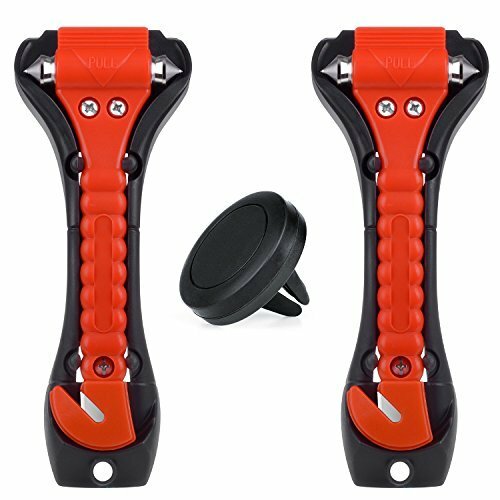 Our car safety hammer set brings you the ultimate safety, helping you escape in case of a car accident. Just grab our safety hammer, break the glass and jump out of your car to protect yourself. Cut the Seatbelt & Get Out- Our life-saving tool not only helps you break your car's window, but also allows to cut your seatbelt with its razor sharp cutter fixed in a curved hook to avoid possible injuries. Get out of your car on time to save your own life. It's super easy to use as there's not any rocket science required to make this happen. Our safety hammer or emergency tool is ideal for trucks, cars, trains, buses, ships and other automobiles. Auto Safety hammer is a must-have escape tool that we should all keep to ensure our safety. Things to Note:Since every window glass gets thick at the middle, it's recommended that you should start from corners or edges where glass seems to be quite thin and one could easily break it down. Once you somehow managed to make cracks, continue knocking until it's all broken. Great Christmas Gift/Thanksgiving Gift to Keep Your Friends and Family Safe! ✄WARRANTY&SUPPORT: Worry-free 3-YEAR WARRANTY (If needed, a free new replacement is available). Any problem, please feel free to contact us, you will get our friendly customer service with 12 hours quick response. Your Kindly Feedback & Reviews Will Be Appreciated. ✄Our double solid cone head car glass breaker hammer is designed to break auto glass windows, so you can easily make a way to escape. The Razor-sharp blade is made of high quality steel that can cut seat belt quite easily. ✄Our safety hammer emergency tool combines a protective bracket for the cone head hammer, making it fine from all aspects. ✄It is a must-have window breaker that everyone should keep to avoid possible damage and loss. The seat belt cutter is mounted in a safe curved hook. ✄Perfectly designed with modern needs in minds, this vehicle tool rescue knife is a great safety tool that can help save your valuable life. If you have any questions about this product by Ran., contact us by completing and submitting the form below. If you are looking for a specif part number, please include it with your message.